Our kindergarten reading/language arts program emphasizes the following twenty-five sight words: a, am, and, at, can, come, go, here, I, in, is, it, like, look, me, my, on, see, said, the, this, to, up, we & you. By the end of kindergarten, students are encouraged to both read and write these high-frequency words correctly. Make the creation of the flash cards a fun activity. Encourage your child to trace the letters on each flash card with dotted lines. Using markers or crayons, decorate the sight word flash cards with the bubble font. Color each sight word and/or add a drawing to represent the word (some words will be almost impossible to illustrate, e.g., the, is. For a more formal look, use the regular font flash cards. I would recommend laminating each card or printing on card stock paper. You will most likely use these flash cards on numerous occasions (I did). This PDF file contains flash cards with a sold print. This PDF file contains flash cards with dotted lines. This PDF file contains flash cards with a bubble font. Click here to view a video of the above flash cards. This PDF file contains flash cards with a solid print. 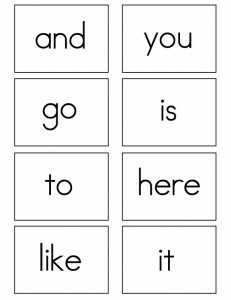 Click here to view a video of the above flash cards as well as the sight word, said, which is noted below. This PDF file contains a flash card with a solid print. This PDF file contains a flash card with dotted lines. This PDF file contains a flash card with a bubble font. The video for the sight word, said, is included above or click here. 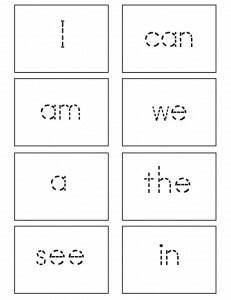 The above sight word flash card containing the word, said, contains seven blank flash cards. 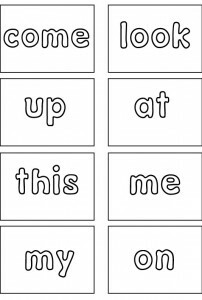 Use these cards to assist your child in automatically recognizing other sight words. Write each sight word on a blank card. Sight words flash cards help a child develop a sight word vocabulary. When learning to automatically recognize sight words, repetition is critical which is why flash cards are a great activity. Remember, every child progresses differently. Gradually introduce new sight words and review previously taught sight words daily. I like the font you use in the flash card. What is the name of the font that you use? I think it is a good font to teach young children. Can you share with me the name of the font that you use in your PDF printable? This is amazing thank you so much just what i was looking for, for her to practice sight words at home after school. Thank you for providing this amazing resource!